Private households in the UK own an estimated £10.3 trillion in property and other assets, most of which is relatively lightly taxed. Following the 2008 financial crash, the need to find additional public resources to reduce or obviate the need for painful spending cuts and fund growing long-term demand for public services makes wealth an attractive potential tax base. However, while it is generally accepted that the current system of property and wealth taxation in the UK is highly flawed, there is no broad political consensus on whether and how different forms of wealth should be taxed. There is also a lack of evidence about the potential impact of different approaches. A recent research project by Kayte Lawton and myself for the Institute for Public Policy Research (IPPR), funded by the Nuffield Foundation, attempts to inform debate by providing a critical assessment of the options for reforming wealth taxes in the UK. It makes extensive use of the new IPPR wealth tax model, the first of its kind to provide detailed data on the distributional impact of wealth taxes. The results from the project have recently been published in the IPPR report Property and Wealth Taxes in the UK: The Context for Reform. In the following article we will set out the arguments for wealth taxes and elaborate on the main proposals that emerged from the report, on replacing council tax and inheritance tax, and introducing a land values tax and lifetimes receipts tax. Why look at wealth taxes? There are good arguments for taxing wealth on both justice and efficiency grounds. The scale of wealth inequality in the UK suggests that taxing wealth may have a role in reducing inequalities in economic resources. Figures from WAS data for 2008-10 show that the distribution of household wealth is highly skewed towards the wealthiest 10 percent of households, who owned 44 percent of all household wealth in 2008-10, equivalent to £4.5 trillion. While we would expect households with older adults in them to have more wealth than younger households due to saving and asset accumulation, this only explains a small proportion of wealth inequalities in Britain. There are strong social justice arguments for taxing inherited wealth and gains associated with owning land and property because both are largely unrelated to the effort of the wealth owner. There is also an economic efficiency argument for some forms of wealth taxation on the grounds that property and wealth taxes tend to have smaller distortionary effects than taxes on labour or profits. This is particularly true for taxes on the capital value of property and land, since the supply of property and land is not very responsive to price. But while economic efficiency and social justice arguments for wealth taxation are important, analysis of the political context in which progressive policymakers have to make the case for reform is often missing. By drawing on historical and international experiences of taxing wealth and providing new analysis of the potential fiscal and distributional impacts of reform, the IPPR research aims to provide a more balanced picture of the scope for reforming wealth taxes in the UK. Furthermore, the current regime of wealth taxation in the UK is inconsistent, inefficient, and inequitable. In particular, council tax is very regressive in relation to property values and is based on property valuations which are twenty years out of date. Stamp duty land tax is much more progressive than council tax, but is badly designed, inefficient and horizontally inequitable (with each household’s tax bill depending on how often that household moves). Inheritance tax can largely be avoided by the very wealthy who can take advantage of loopholes to reduce or eliminate their tax bill entirely before death. If the present system is such a mess, how might we improve on it? First, we have to measure the distributional impact of wealth taxes. Simulation modelling of the distributional and revenue effects of taxes and benefits has been happening for decades, but no equivalent has existed for wealth taxes. Now IPPR has created the first detailed model constructed to provide this data for the UK. The model is a computer program that estimates the effects of changes to the taxation of wealth on household budgets and on aggregate tax revenues. It does this using detailed and representative micro-data about the ownership of different kinds of assets by private households. The main dataset used in the model is Wave One of the Wealth and Assets Survey (WAS), which interviewed around 30,000 households in England, Scotland and Wales between 2006 and 2008 (two more waves of WAS have subsequently been collected). WAS is the most authoritative source of micro-data on household wealth holdings in Britain and collects detailed information on four groups of assets: property, private pensions, financial assets and physical assets. The model can currently be used to analyse the impact of taxes on the capital value of wealth holdings (net or gross and applied to total wealth or specific kinds of wealth, such as property) and on property transactions. The impact of changes to inheritance tax can also be assessed; however, the number of households receiving an inheritance in the data is very small so the value of the results is limited. The model estimates the distributional effects of taxes according to the distribution of household income or wealth as well as other household characteristics such as age of the head of household. The model can also calculate the revenue yield of various types of property or wealth taxes. - Replace council tax with something more equitable and efficient. - Consider first-steps towards a land value tax. - Replace inheritance tax with a lifetimes receipts tax. One option would be to replace council tax with a housing consumption tax designed to fund local services and levied on both owners and tenants. The tax could be designed in a number of different ways, but a flat-rate charge levied as a proportion of current property values would be the simplest option. The Institute for Fiscal Studies’s Mirrlees Review of the tax system proposed replacing council tax with a housing consumption tax, which if charged at 0.6 percent of property values, would raise a similar amount to council tax in aggregate. Households in property values worth less than £250,000 would pay less than under the current council tax system while those in more expensive houses would face a larger tax bill. Another option would be to replace council tax with a genuine property value tax levied only on property owners. The purpose of a property tax, unlike a consumption tax, is partly to raise more money as real house prices rise, so that the tax rate stays the same regardless of fluctuations in property values. This would help dampen house price volatility; the total tax burden on a property rises with the value of the property, pushing up the overall purchase price and making the property less attractive as an investment. The OECD has argued for the introduction of a property tax in the UK (as well as in a number of other countries) to lessen the attractiveness of housing as an investment and discourage people from leaving properties empty. The IPPR wealth tax model allows us to consider the impact of a property tax. There is a limitation to the model: the WAS data underpinning it does not capture the value of residential properties that are owned by entities other than private individuals and households, which HMRC statistics suggest are a relatively large share of high-value properties (for example, two-thirds of properties built for more than £2 million in the UK were purchased by companies or trusts). This means that our analysis is likely to underestimate the revenue that a property tax like this would raise. The IPPR research models the effects of a flat-rate 0.5 percent annual tax on the gross value of all residential property owned by private individuals, with no threshold or tax-free allowance. We estimate that this tax would raise approximately £20.8 billion per year from private households. If the property tax were applied to properties owned by companies, trusts and foreign owners, it would probably raise at least £26 billion (an amount equal to the yield from council tax in 2012-13). The graph below shows the distributional effects of the annual property tax. The blue bars show the average annual amount of the tax in cash terms for each decile of household wealth in WAS (to construct the deciles, households in WAS were divided into ten equally sized groups according to net household wealth). The green line shows the average annual amount of the tax as a percentage of annual income by wealth decile. The tax is strongly progressive with respect to the distribution of wealth; households in the second decile pay less than one percent of their annual incomes on average, compared with just under 7 percent for households in the wealthiest decile. 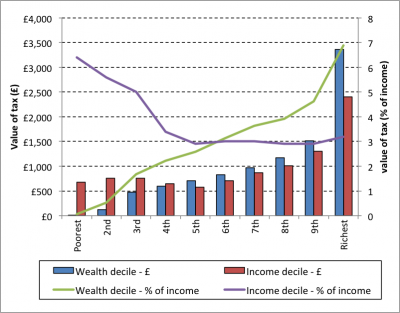 The red bars show the distributional impact according to income decile (with households in WAS divided in to ten equally sized groups according to disposable income, adjusted for household size). The poorest six deciles pay around the same on average in cash terms – between £600 and £800 per year, with higher average cash payments for the richest four deciles. As a percentage of income by income decile (the purple line) this means that the property tax is regressive – the poorest four deciles pay a larger percentage of their annual incomes (on average) than do the richest six deciles. This finding reflects the presence of ‘asset-rich, income-poor’ households towards the bottom of the income scale, which would be an important consideration in any reform plans. However, this regressivity is also present in the current council tax system, but on a larger scale. The IPPR report considers a wide range of other possible reforms, including the Liberal Democrat idea of a ‘mansion tax’, reforms to Stamp Duty to make it more progressive, and an annual tax on net wealth (rather than just property wealth). While not dismissing these proposals, we think there is a strong case for reform in respect of land value tax and a lifetimes receipts tax. A land value tax (LVT) is a tax on the underlying value of land regardless of the value of any property or development on it and is widely supported by economists as an efficient way for the state to raise revenue. The tax imposes a windfall loss on the post-tax value of the land but does not diminish incentives to use or develop it precisely because the tax attaches to the land even if it is not used or developed. A lifetime receipts tax is a tax on the amount of wealth a person receives through gifts and inheritances over their lifetime. Every person would be able to receive wealth in this way up to some lifetime threshold and tax would then apply, possibly at a progressive rate, on gifts and inheritances above this threshold. Many people have proposed a tax of this kind as an alternative to the present inheritance tax (which raises much less revenue since the changes made in 2007). The main problem with the tax is administrative (keeping track of receipts) but the Republic of Ireland’s experience suggests the higher administrative costs are not prohibitive. We hope in future to improve the IPPR wealth tax model, which is not able at present to model the impact of land value and inheritance tax options. But the work described here helps to start the informed debate on wealth taxation we urgently need. At a time of austerity we need a system of wealth taxation that can pull its proper weight. The current system does not do so and is in many respects inefficient and unfair. We must – and we can – do better.